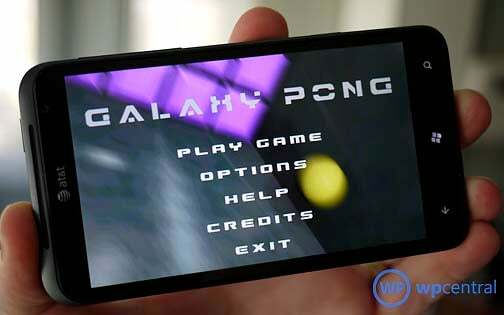 Simply put, Galaxy Pong is a cool game for your Windows Phone. Remember the game Pong? The video game that started it all? Now imagine it being played on a three dimensional playing field with bonus targets scattered about between the two players. In a nutshell, that is Galaxy Pong. 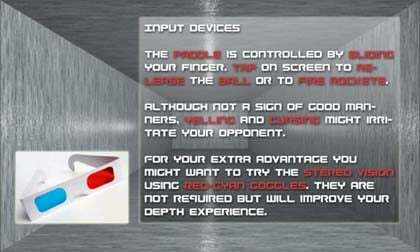 To add to the coolness of Galaxy Pong you have the capability to flip a switch in the settings and play the game in classic 3D view (you've got to provide the glasses though). Galaxy Pong is an entertaining, fun, somewhat addictive game for your Windows Phone that definitely taps into the coolness factor. The main menu of Galaxy Pong has options to play the game, access the options, view the help screens and view the developer's credits. Options are basically the sound/music on or off as well as turning on/off the Depth Vision. Depth Vision gives the game the 3D view that requires the red/cyan anaglyph glasses. You move your paddle around by touch and you can bounce your return shots off the side walls, floor or ceiling. A collection of tiles lie in the center of the playing field that include a handful of power-up or bonus items. With each shot you shatter through these blocks to gain points. If you miss a shot, the yellow ball splatters against your Windows Phone screen and obscures your view a little. The ball also splatters on your opponents side of the field, technically limiting their view as well. There are two ways to end a game of Galaxy Pong. First, if any player misses the ball three times, the game ends and the player with the most points wins. Second, when all the tiles are shattered a bomb will being to rotate around the center of the playing field. If you hit the bomb it will explode on your opponents side of the field and end the game. This will yield you 1500 points and whomever has the most points after that wins. Game play was entertaining and overall I found Galaxy Pong to be a nice addition to the Windows Phone game library. I do think a tournament mode would give Galaxy Pong a little more staying power. Still, Galaxy Pong isn't a shabby game to pass the time with. There is a free trial version (time limited) available for Galaxy Pong and the full version is running $1.99. You can find Galaxy Pong here at the Windows Phone Marketplace.